Hamburg, 1936; during the celebration for the launch of a ship. 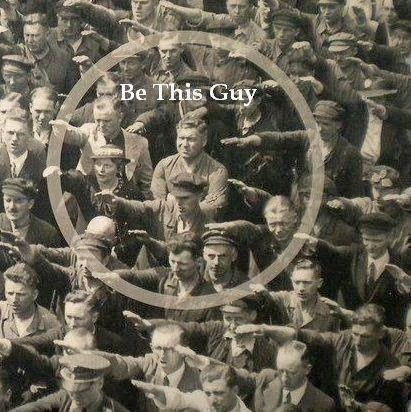 In the crowd, one person refused to raise his arm to give the Nazi salute. The man was August Landmesser. He had already been in trouble with the authorities, sentenced to two years hard labor for marrying a Jewish woman. We all have the ability to be courageous. We simply have to make the hard choice, and decide to strongly misbehave if our values and principles compel us to do so. If you face a situation where the beliefs of others pressure you to compromise your own, be courageous. Even at our most ordinary, courage is our omnipotence.